Bonjour — are you ready to take a trip? 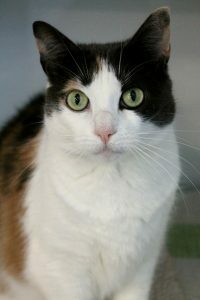 My name is Paris and I am a beautiful 7-year-old calico girl who is as social as I am striking! 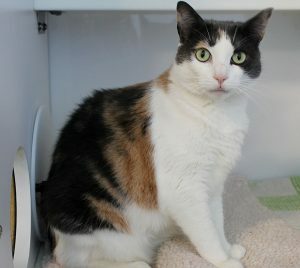 I came from a home where I lived with another cat and have had a ton of socialization — some would describe me as “dog-like” because I’m so friendly and playful! My coat looks like a Monet painting with swirls of red and black and my eyes are a beautiful light green that will draw you in. I like to roll around on my back and make croissants with my paws whenever I see a friendly human face. I have lived indoors my whole life and would probably do wonderfully around other mellow cats, kids, and dogs — I’ve lived with all three and nothing really seems to phase me! When I first came into the shelter, the stress of the transition did cause me to have some crystals in my urine, so the vet said I should eat a special food for now until I find stability again and another vet can decide to take me off of it. I have no history of urinary issues and am a very healthy cat who had a recent dental and regular vet care prior to coming to Pixie. Are you interested in meeting me? I’m currently stealing hearts over at the Petco Unleashed on NW 23rd & Burnside — stop by today! I come to you fixed, vaccinated, and micro-chipped for an adoption fee of $100.